One of the top challenges facing any HR practitioner is to manage the many processes that take place in the HR function, from recruitment and on-boarding to learning management to payroll processing and grievance handling. With the availability of technology and automation comes the pressure to identify processes that can be optimised so that the HR function can channel more resources to be more strategic rather than transactional. Business Process Re-engineering (BPR) is a business management methodology, originally pioneered focusing on the analysis and design of workflows and business processes within an organization, with the purpose of optimising the time and resources by identifying redundant processes and also opportunities for technology to be leveraged upon. It has since become a key strategy adopted in all change management projects in various industries and disciplines including HR. In this 1-day workshop, our facilitator would relate to his own experience as a HR practitioner involved in change management projects, the largest which was during a merger where he played a leading role and one of the main tools he used was the BPR methodology. Lim Cheng Tiong, Tom is a USA Certified Career and Performance Coach (GCDF), an experienced Regional Human Resource Practitioner/Consultant and a Trainer/Facilitator who specializes in process facilitation, experiential, action-learning and behavioral-based training. He has travelled extensively in the Asia region to conduct training and development programs providing a range of junior, middle and senior Management and Human Resources workshops. A resourceful and results-oriented professional with successful track record of over 20 years HR experience in full-spectrum Regional HR Management and Leadership from working in various MNCs and International global organisations. He possesses strong expertise in corporate re-engineering through rightsizing and talent maximization. He currently holds the appointment as the Human Resources Assessor for the IHRP-SP (Institute of Human Resources Professionals), in which he provides assessment of companies’ state of Human Capital Maturity to identify gaps and provide recommendations and intervention for improvement. A well-rounded and good-humoured person who functions effectively at engaging all level of business leaders, cross-functional colleagues and employees. He is recognised by senior business Leaders and corporations for consistently achieving excellent results. These proven track records of developing partnerships, driving employees engagement, facilitating performance initiatives have led employees to succeed with integrity. As a Global Career Development Facilitator (USA) credential holder, he is trained to help employees, both individually and in a group setting, make informed decisions when considering their own career development. Through the use of best practices, various assessment tools, and career development models and equip each individual with the knowledge and skills to embark on their professional journey. Effectively bilingual in English and Mandarin, he has extensive years of experience in providing executive coaching to line managers and Executives in enhancing career development and improving people and work management skills, within the complexity of a dynamic global organization. He also provides career transition coaching to help displaced workers improved their re-employment prospects. As an Adult Educator/Corporate Trainer, his passion in employees ongoing education and development started during his numerous Corporate HR and Learning and Development roles - providing in-house stand-up trainings to both HR team and business leaders/employees. He currently conducts talk, academic lecture, teambuilding/HR workshop, provides HR consultancy to private and public organisations incluing Government-Linked Companies; both local and overseas including the Kingdom of Bhutan, Maldives, Vietnam, India, Singapore, China, etc. He facilitates adult training in a fun, lively and engaging manner through the use of case study, role-play, mini lecture, group discussion, exercise and game. His methodology of action-learning delivery aims to ensure that his participants come away with new skill-sets and knowledge that will be put to good use in the workplace. Additionally, he conducts workshops and are committed to helping HR practitioners in developing HR Strategic Plans and HR Road Maps that are aligned to business strategy for their organisations. Amongst many local and overseas Management and HR training workshops he had conducted, it is noteworthy to mention that in September 2017, he developed and delivered Performance Management and Appraisal Skills Training (Performance Management System and Competency Mapping) to a class of 30 participants comprising academic Lecturers and Professors of the Administrative Staff College of India, ASCI (Hyderabad). In December 2015 and in April 2017, he successfully conducted a re-run of a week-long HR Certification Workshops on Competency-Based Interview & Selection Techniques in the Kingdom of Bhutan for the Senior Executives and People Managers of the country’s largest Hydro-Power State-Owned-Enterprise. Most recently, in July 2018, he flew to Maldives and provided 20 Senior Executives from the Bank of Maldives with the key skill-set in becoming an effective interviewer. This is a highly powerful and effective workshop in which he personally designed, developed and delivered to his corporate participants. Most certainly, you are asking yourself the question in how far corporate English varies from general English if there are more similarities than differences. Even if you have tremendous English skills, you might lack specific knowledge of English that is used in a corporate world or business and trade environment. Business English courses focus on skills that are applicable to the workplace, on special vocabulary that you might encounter during phone calls, negotiations, meetings, etc. and also on general topics that occur within international trade relations. This course is designed for the EFL (English as a Foreign Language) learners of Elementary & Mid level for their professional development. This course deals with the basic English necessary to deal the daily activities at the work place. It is aimed to cover Corporate Communication essentials, Writing & Speaking Skill along with the special emphasis on related Linguistic items, Phrases & vocabulary and some other general aspects of English for daily corporate communication. Tiash Mahjabin is a Trainer of Business communication & Eng. Language, having more than 7 years’ experience in English Language Teaching and Training. She has her expertise in CLT [Communicative Language Teaching] method of Teaching and Learning & different EFL (English as a Foreign Language) training methodology. She designed and conducted different English Language Courses & workshops concentration on ESP [English for Specific Purpose] based outline what leads to fulfill the customized demand of different group of professionals . She facilitated many sessions as Public Program as well as customized corporate programs for different corporate. She takes session at BUTex. She has experience and expertise in designing and facilitating workshops, trainings and short courses on ‘English at Work Place’, ‘Business English for Professionals’ , ‘Corporate English’ ,‘English in Day to Day Use’, ‘English Grammar for Corporates’, ‘Business English Writing’, ‘English in Regular Conversation in Corporate’,‘Pronunciation in British Accent’, ‘Pronunciation in American Accent’, ‘Easy way of learning Phonetics’ & ‘Common Mistakes in Business English’ etc. She facilitates both public & corporate programs personally & under the banner of WARD, bdjobs, BJTI . also completed Post Graduate Diploma in HRM (PGDHRM) and Graduate Diploma in HRM (GDHRM). She is pursuing her MBA in HRM. She is pursuing TEASOL in Business English. Introduction: Individuals who chose to become HR professionals frequently made that decision to help people attain their career goals. The HR professional is often seen as the liaison between the organization’s management and the employees. Most HR professionals would rather work with people instead of numbers. This workshop will explain some metrics and Analytics that an HR professional can use for the functional excellence of HR area as well as in business. These tools of Numeric HR will help every HR professional to be logical, rational in different analysis, measurement, reporting and selling ideas. Mr. Zaidi is Training, Organization Development and HR specialist having more than 18 years’ experience in different industry. He is a Business Process Reengineering Consultant. He is a senior Fellow of Management & Strategy Institute – USA. He has exposure as KPI consultant at home and abroad. He is Member of KPI Institute Australia. He has completed Masters in HRM under the University of Dhaka. He received World Training & Development Leadership Award in 2016. He is a certified Lean Office Professional. He is a Professional International Member of Association for Talent Development [ATD, largest association for training & development worldwide], a member of Certified Professional Trainer Network [CPTN] - Canada & certified Trainer from City & Gild– UK. He is also member of American Management Association (AMA) and Society for Human Resource Management (SHRM) USA. He is also a Management Consultant accredited by Institute of Management Consultant Bangladesh. Mr. Zaidi attended as speakers in International Conferences in Singapore, Malaysia, India, Bangladesh and Nepal. He is also guest faculty for Public & Private Universities in Bangladesh. Mr. Zaidi has rendered Consultancy Service for Business Process Reengineering, Setting KPI, designing effective Performance Management System, Running Assessment Centre, Organization Restructuring, HR Audit, Process Development, and Competency Mapping for Human Resources, Organization Development, for more than 30 organizations at home and abroad. He is an expert Performance Coach for different functions. 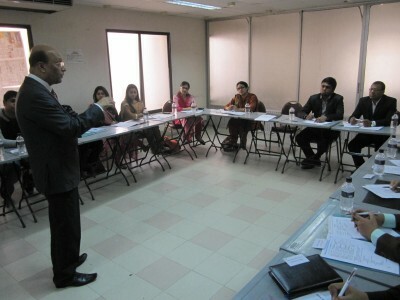 He has conducted training in different countries including Singapore, Malaysia, India, Nepal, Bangladesh. What makes for an effective employee ? importance of Emotional Intelligence in People and management. Re-frame the Feedback when faced with the Fear of Feedback – Fear Itself, Procrastination, Denial, Brooding, Jealousy, Self-Sabotage. Learning Overview Everyone knows a story about a highly intelligent, highly skilled employee who was promoted into a managerial or leadership position only fail at the job. And they also know a story about someone with solid - but not extraordinary - intellectual abilities and technical skills who was promoted into a similar position and then soared. Such anecdotes support the widespread belief that identifying individuals with the “right stuff” to be a manager or a leader is more an art than science. After all, the personal styles of superb employees vary. The most effective employees all have what has come to be known as Emotional Intelligence which goes beyond IQ and technical abilities. To enhance emotional intelligence, organizations must re-focus their training. They must help people to break old behavioural habits and establish new ones, which also requires an individual approach beyond conventional training program. Feedback from others, self-practice, coaching, mentoring are some approaches that could be tapped to help employees who are thought to be low on Emotional Intelligence. • Understand the importance of Emotional Intelligence in People and management. Can Emotional Intelligence be learned? • Re-frame the Feedback when faced with the Fear of Feedback – Fear Itself, Procrastination, Denial, Brooding, Jealousy, Self-Sabotage.